A lot of restaurants are closed on Sunday in Paris so when I found a place that was open on that day, I bookmarked it. Turns out, it is famous for its hot chocolate, so we made plans to definitely stop in on our last Sunday of vacation. The place? Angelina. It was founded in 1903 and the interior was designed by the famous Belle Epoque architect (Edouard-Jean Niermans). It's a pretty large space with a lot of space between tables. There was a short line when we arrived but it was only about 5 minutes before we were seated. I was not very hungry and it was early-ish. 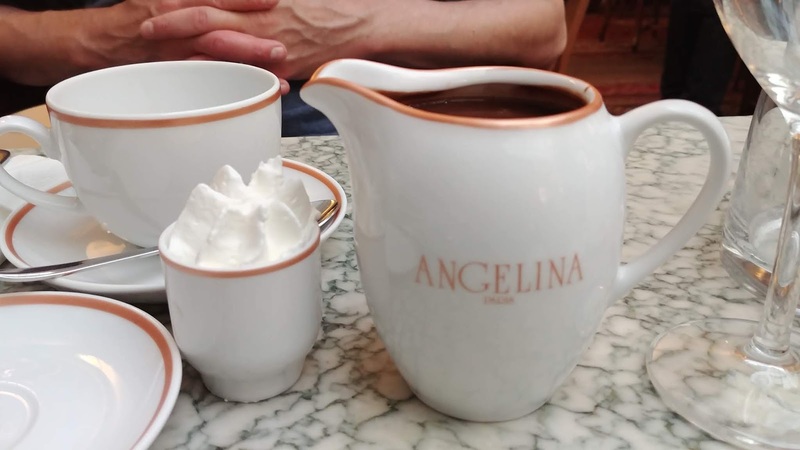 Even though Angelina is open on Sunday, it closes at 7:30 pm. 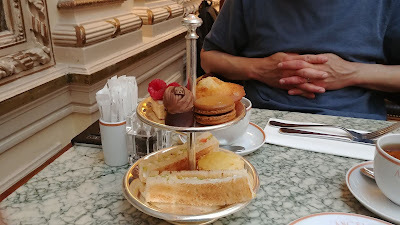 Our walk around Paris and stops in shops hadn't taken as long as we thought they would, so we found ourselves there around 5 pm, not that long after we'd eaten crepes at Breizh Cafe. So I opted for Angelina Tea Time (selection of cocktails canapés, selection of mini pastries [mini macaroon, madeleine] and thé, café, or hot chocolate). 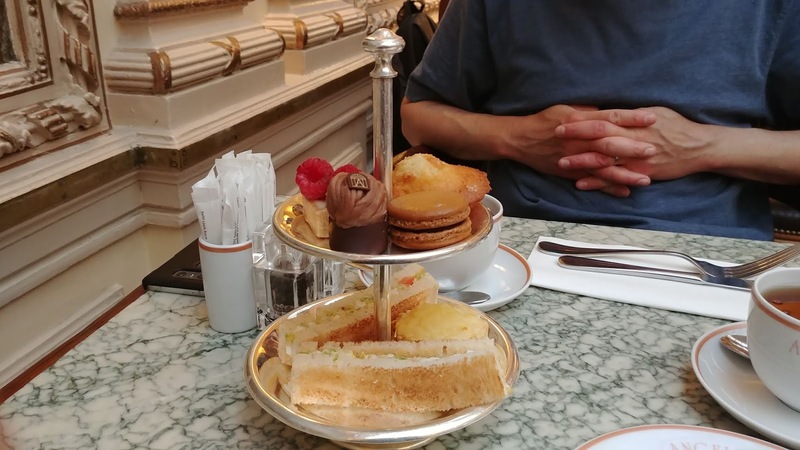 I chose Earl Grey tea. Two tiers of treats. The mini sandwiches were a croque monsieur round, chicken salad, and salmon. SP got to eat the salmon one. 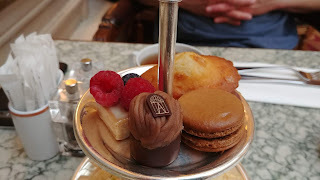 The sweet treats were a madeleine, macaron, fruit tart, and a mini version of their signature dessert: Le Mont-Blanc (Meringue, light whipped cream, chestnut cream vermicelli). They were all quite tasty. 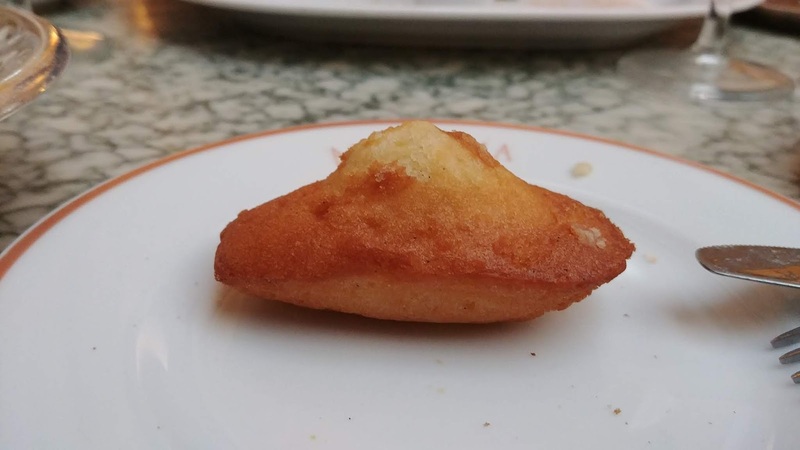 The madeleine had a huge hump! I tried a bite of his chicken and oh my gosh it was so deliciously juicy and flavorful and had crispy skin. I wish I'd ordered what he ordered! Even though I'd already eaten 4 mini treats, SP wanted me to share a dessert. 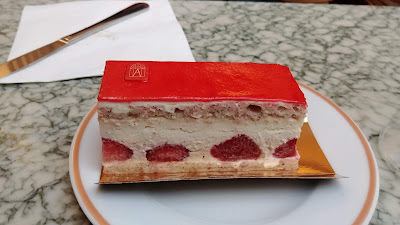 He chose Fraisier (hazelnut biscuit, light vanilla cream, fresh strawberries). It was light and creamy. A good hot weather dessert. 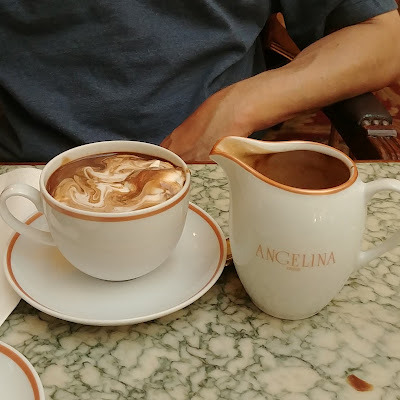 We decided we had to try the famous hot chocolate. We shared one, and I am glad we shared because it is rich. So chocolaty and thicker than the kind served here (the weak kind made with water instead of milk/cream!). Adding whipped cream was a must! It was good, but I wasn't blown away by it like so many others. Neither was SP. 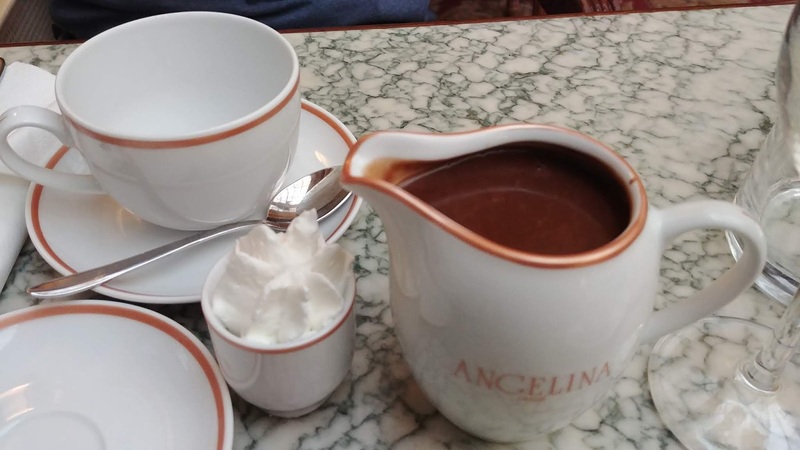 We think it's because we rarely, if ever, have hot chocolate here in the US. 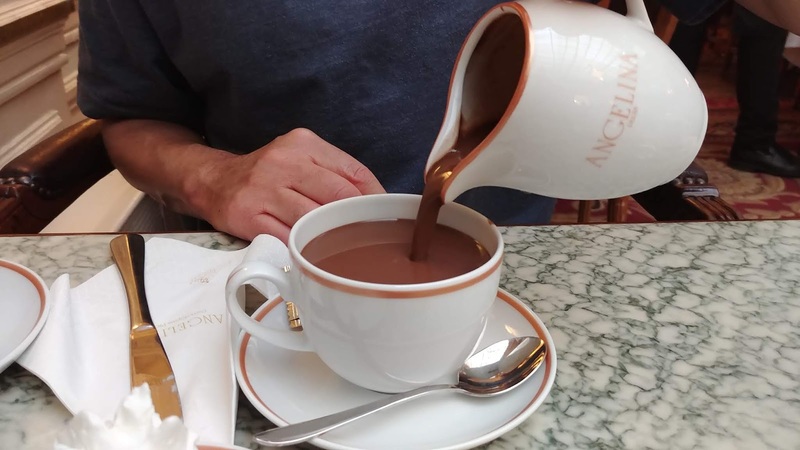 When we do, we make it ourselves, and we use milk/cream, not water, and we melt a good chocolate, we don't use a packet of powdered chocolate. 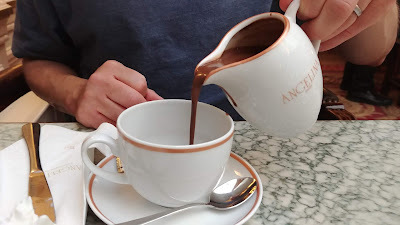 So it tasted like the hot chocolate we make for ourselves, not the usual packet of powder mixed with hot water. 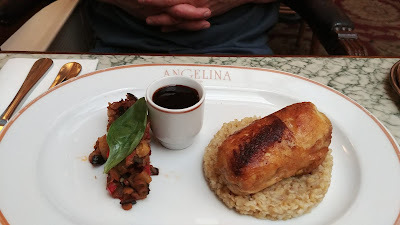 There are several Angelina locations in Paris. we went to the one at 226 rue de Rivoli, Paris 1er. 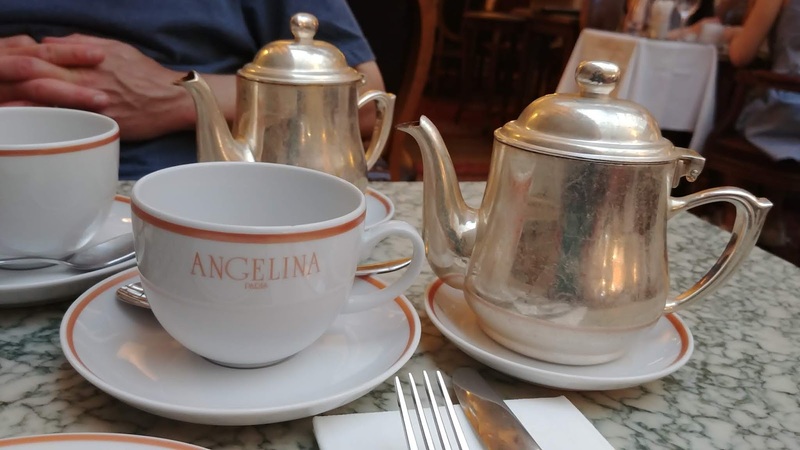 You can also find Angelina at the Palace of Versailles. We would go back. Some might think it's kind of pricey. some will complain about the hot chocolate (I saw complaints in numerous reviews, about how thick it is, about their kids not liking it, etc.). But we enjoyed our food and the hot chocolate. 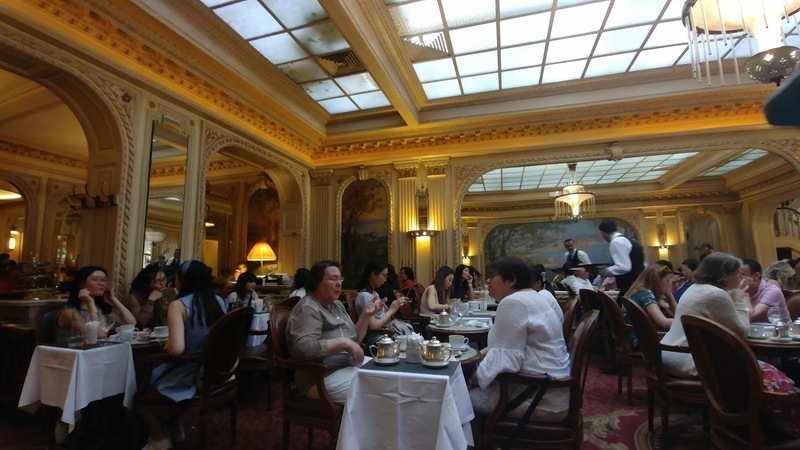 It was calm, relaxing, and cool inside (it was yet another hotter than usual day in Paris). Our server was good, spoke English, the menu had English translations. 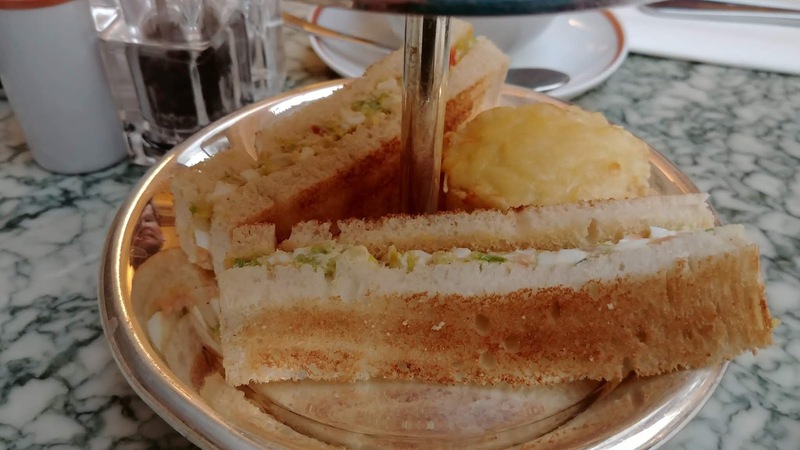 It's one of those places that you might want to visit just because of its history (From the website: "For over a century the tearoom has built a reputation as a place of sophistication and indulgence. As soon as it opened, Angelina became the place to be among the Parisian aristocracy. 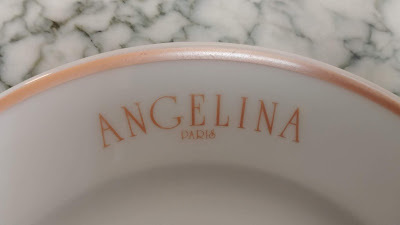 Proust and Coco Chanel rubbed shoulders with the biggest names in fashion in Angelina's salons. ").